"Aspiring Connoisseur Beer Tasting Set, 13 Pieces"
"Beer might have been easier when it was all yellow fizzy stuff, but it certainly wasn't as much fun. If you are looking to learn more about the world of beer, our aspiring connoisseur beer tasting set will tell you everything you need to know. 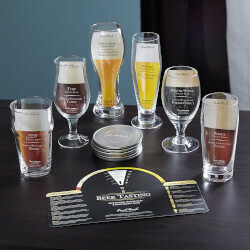 This beer testing kit includes six different types of beer glasses and directions for how to serve them at their most flavorful peak. A rotating wheel of beer facts is included, helping you to know food, cheese, and dessert pairings that will have your palette thirsting for more. Six stainless steel coasters are included with a cork, nonstick backing. So put down the yellow fizzy stuff and join the hoppy revolution!Wheat Beer glass, 11.8oz, Tulip glass, 8.5ozPorter/Stout glass, 8.5oz, Pilsner glass, 8.5ozNonic glass, 10ozStange glass, 10oz"